I have a (literally) dirty little secret. See.. our home for the most part is clean and organized. We have neighbors that we adore that may pop over at any minute, so that helps us keep a clean, presentable house. But there is one room that is a disaster zone. I'm talking tornado-just-hit-call-the-news disaster. And for some reason, I'll claim temporary insanity, I'm going to share this room with you. But if you are familiar with my blog, you know I like to keep things real. If I was a sane person, I would have cleared all the junk out and then taken before shots.. but that's not real. This is what it looks like all the time. It's a space that isn't functional and that needs to change. The worst part is, we keep our adult beverages in the fridge in the garage so when we have company, we have to pass through this space to get a beer. It's EMBARASSING. Even though it's just a laundry room, it gets seen more than I'd like it to. The biggest project on our list is to rip up the vinyl flooring and lay tile. Then we'll organize and make this space FUNCTIONAL and pretty :) Because tiling will take the majority of her time here, husband and I are going to clear out the room, take off the remaining wallpaper backing and paint this weekend. Ohh this will be fun! What fun and a super sweet mother in law to help! Maybe I'll redo along with you, although it would seem almost sinful to work on my laundry room while my office looks like an episode of Hoarders. Hmmmph. Love that you always keep it real, Bryn. 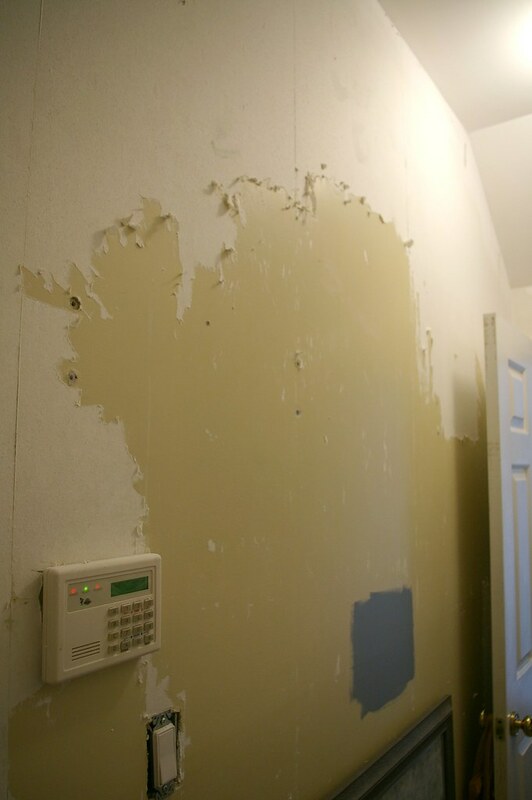 And really gnarly before photos are great; they make the difference in the afters so much sweeter! Oh, its not sooo bad- Ive seen way worse, so dont feel too bad (like my family room floor when I was in the middle of wedding planning, talk about a bomb haha) Just think of the really pretty after photos you'll have- it will be a dramatic transformation and look amazing once you put your creativity into the space! Thanks for your honesty! I think we all have a little or a lot of that in our homes from time to time.. I look forward to seeing what you do with the space! Can I just say, in the sweetest most kindest way possible..give me a break ! LOL ! This doesn't even come close to one of the worst "befores" I have ever seen...not even in the same solar system (have you ever seen the blog "my ugly baby" ?). This is "real" and there is absolutely nothing to be ashamed of. Can we as real women and bloggers stop apologizing for toys on the floor, dust on the buffet, and dirty slippers appearing in photos ? You are so talented and none of us who are following you on your journey would doubt for a minute that you a could turn a sow's ear into a silk purse...so I imagine that this room will be fabulous in a pinch ! Can't wait to see the after! Also, this room has nothing on my apartment right now after our move this past weekend and I'm jealous you have a laundry room. haha... you DO have your work cut out for you! good luck! I can't wait to see what you do with the space! I'm sure you'll make it classy chic by the time you are done. 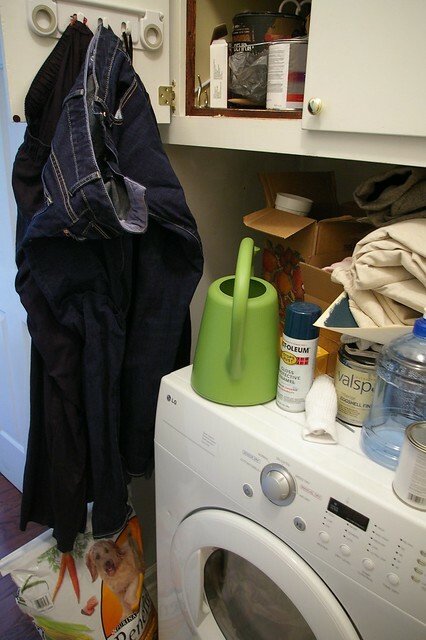 I've recently had the desire to tackle our laundry room as well. It's a large unfinished space so it's a blank slate, but a large one. I love a good Before. It would be fun if you show us some Durings too. I'm in the process of re-doing my laundry closet. I'm sure whatever you do to this room will be awesome! Oh, girl. 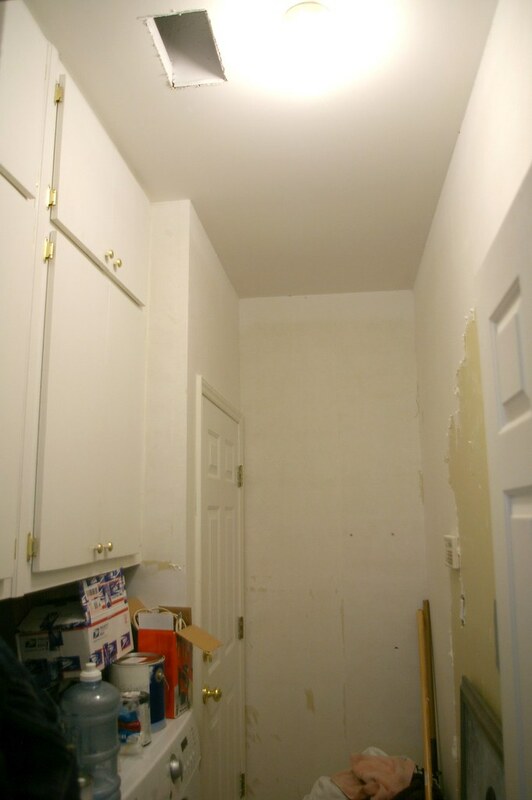 Your laundry room isn't pretty... but if you want to feel better about yourself, take a look at the before shot of my home office. YIPES. Somebody call "Hoarders." I can't wait to see what you do with it! I do not think this is really so bad. 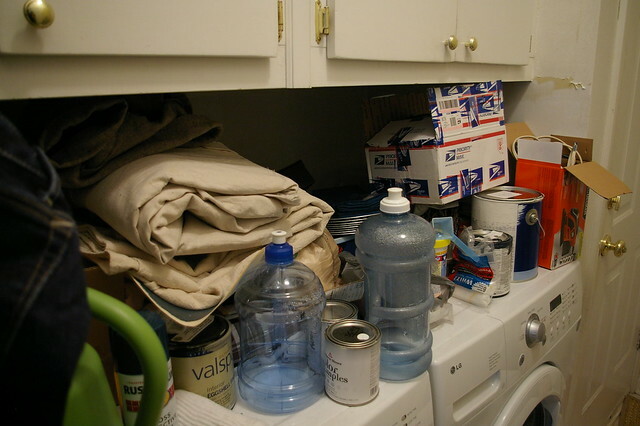 I think that everyone has a room, a closet, a garage in their home that is the dumping ground for all the stuff they have no where else to put, but at the same time want to have handy. I think you are lucky to have your mother in law come to help! Cannot wait to see it finished. 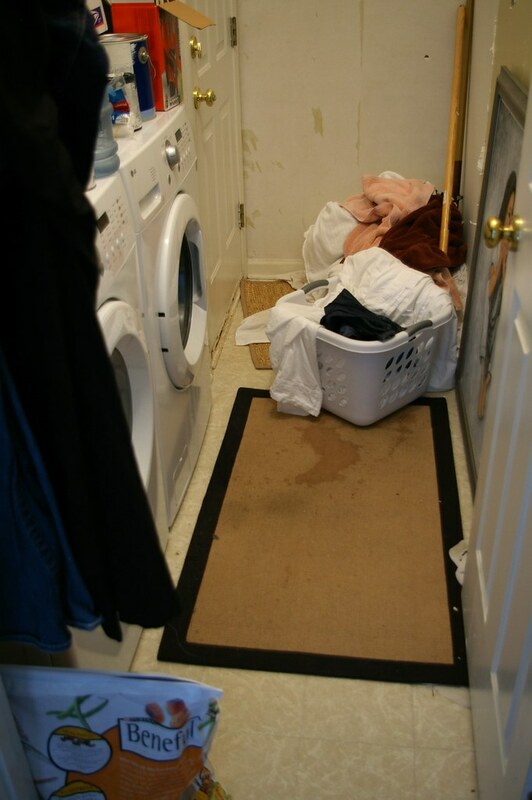 It could be worse (like moldy worse) but it definitely doesn't inspire clean, fresh laundry, does it? Our laundry is in our dark creepy basement (I don't look around too closely) of our rental (otherwise I'd be gutting it and painting it all white). I also struggle with storage of DIY items that aren't straight-up tools, so I'm curious to see how that goes and what solutions you find. Best of luck! I love me some before and afters. Can't wait to see yours!! I'm sure it will be a great functional space when you're through! I just wanted to add, I couldn't help but notice the Beneful dog food bag. You may want to look into feeding Charlotte a better food that has less filler. The website www.dogfoodanalsysis.com has rankings of foods. I know with our dog is doing 10x better on a healthier food than when we first became owners and didn't know. A miss conception is that just because we do this all day for other people and business that our homes are always perfect. 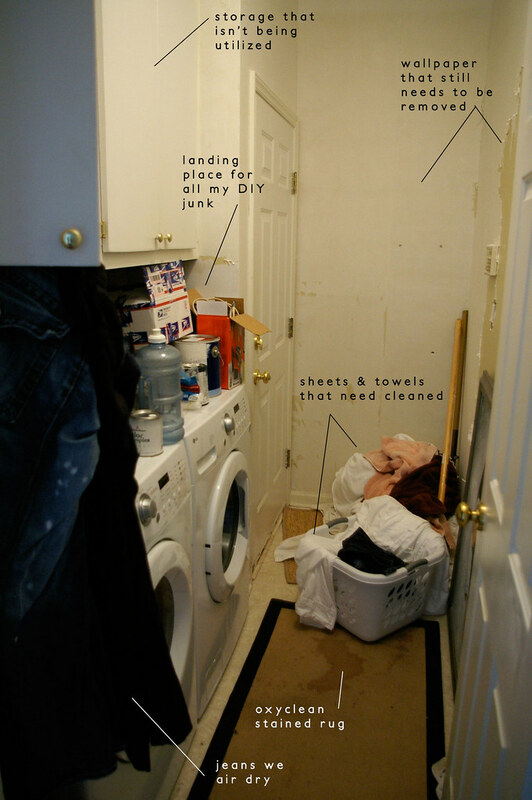 My laundry room too is not so pretty. Mine has brand new cabinets that the doors have yet to be put on after almost a year. They are still leaning up again the wall, sitting on the torn linoleum floor. Ekkk! Sometimes it's just easier to close the door at the end of the day. I love that you are showing us this. I remember that you had to make sure you gave me a disclaimer before you let me walk through your laundry room. I can't WAIT to see it when it's done! I think all of us who have bought a home in the last couple years have a room like this, whether a normal room or the basement. My husband calls our basement the place where furniture goes to die because I've picked up so many pieces to work on. And that's in addition to the hundred or so boxes my parents brought on a U-Haul nearly a year ago that I've finally begun going through. I'd have to agree with the others: that's nothing. I have a 5' x 12' room that we like to refer to as the stupid room. I mean, what are you supposed to do with a room that size? It has become my junk room: lighting fixtures I haven't hung, my daughter's school work, I think there might be a file cabinet in there, lots of decor magazines, books I have yet to read...the list could go on. You can barely get into the room because the junk is piled like 3ft high. One day it will be something fab...one day. That is almost exactly what mine looks like. Same crap on the counters and dog food on the floor! I'm excited to see how you make it functional! You are adorable and funny, funny, funny! I love that you are "keeping it real". It's actually a great space and I just know that when you are through the after shots are going to have us all viewing photos with our jaws dropped!! We all have unfinished projects, thanks for sharing yours. I'll look forward to the makeover reveal!! I can't wait to see the room when it's done!